Cells for Cells Partner, Mr. Goodcents Celebrates 20th Anniversary with a chance at free subs for a year or $20,000. 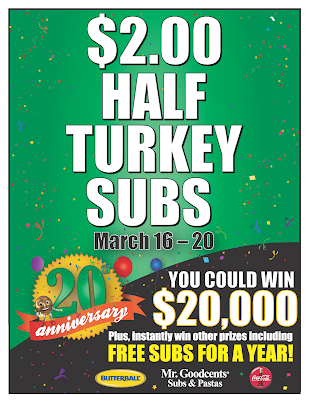 If you are hungry for a great sandwich from Mr. Goodcents, stop in between March 16-20 for $2.00 Half Turkey Subs! Here’s the link to Mr. Goodcents location finder.